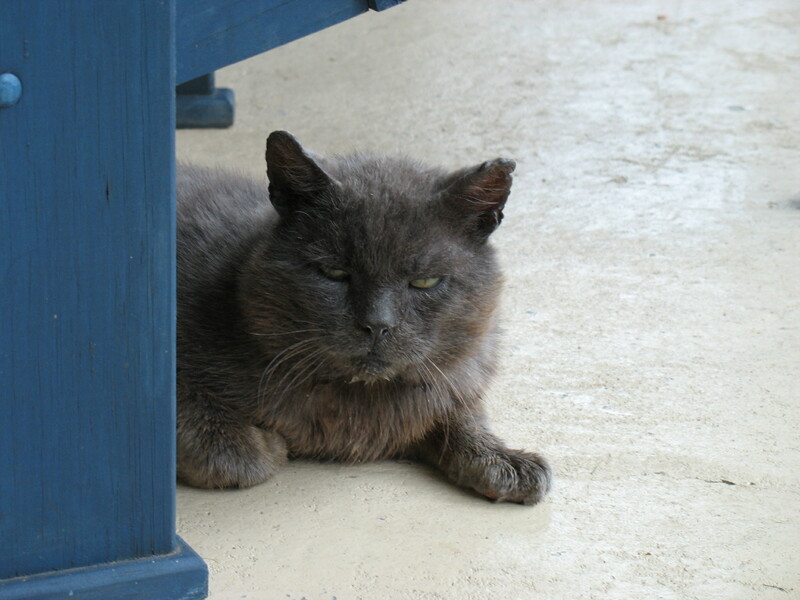 In the spring of 2007, the second spring that Paul and I owned the Hillsdale House Inn, we spotted the skinny, arthritic, old and almost scary looking grey cat. He had been a feral cat in the area for quite sometime; in fact my first sighting of him was in the fall 2001 when I first moved to Annapolis Royal. When the sun shined, even from a distance, he had a brown tinge to his fur, and naturally the name Charcoal was given to this very interesting feral cat. Both Paul and I love animals deeply and started our mission to try and feed this wild kitty. For the first several months we would put food out on the side veranda, he was so wild that even knowing there was food on the way; he would run if we opened the door and he happened to be within 150 feet of us. We gave him lots of space and even Simonette our indoor/outdoor Siamese cat seemed to respect that the food was for someone in much greater need. By the end of the summer of 2007 we could talk to him through the window and by the late fall we could be outside within 10 feet. As winter was about to approach we were scared for his survival outdoors for another winter. The search began and we were lucky enough to find an insulated cedar cat house on the internet, handmade in, of all places, Cape Breton, Nova Scotia. We then came across a website that specializes in feral cat products and found a heater for his new digs. Everything arrived and we installed his house on our covered veranda, poured a glass of wine, sat in our lawn chairs and wondered how we would ever get in him to go in his house. Well cats are sneaky and without us noticing, he had found his new house, assumed it was for him and was curled within 10 minutes. Stay tuned for chapter 2………….. I thoroughly enjoyed the story of Charcoal the Cat and look forward to chapter 2. It's nice to know in this busy world you can stop and give comfort to a little animal in need. We love the Hillsdale House and were happy to see you are rated the #1 B & B in Nova Scotia on Trip Adviser. Congratulations! I have a beautiful feral cat that comes to my door everyday looking for food. As with your charcol cat, as soon as I approach the cat runs under my deck. He/she does resurface to eat once I am gone. I believe she once had some human contact because although she hisses at me, she does cry for the food to let me know she is there. I am wondering where in Cape Breton you got your outdoor house. I am located in CB and all of the sites online are US site (although all say the houses are built in NS), I could not find any contact info for the actual place that was producing these houses. With winter just around the corner I would like to make sure this cat is protected fromthe elements. Do you have a contact for this place in CB.